Take a slice of bread. Apply butter on one side. Same way apply butter on all the slices. Arrange four slices in a baking tray. 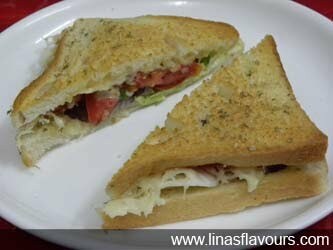 On each slice arrange lettuce/cabbage leaves, onions, tomatoes, capsicum, salt, oregano and grated cheese on the top. Cover it with another slice. If you like sprinkle some oregano on the top also.